2014 has finally arrived and most of us are wondering what the year will hold in store for us. I know what it holds in store for me. Writing, hard work and more exercise (cringe). 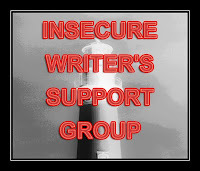 Of all the things we become insecure about this year, let’s not allow it to be our writing. Sure, our work can always show more improvement and sure, we are receiving rejection letters by the dozens. But each of us has a unique voice and style. Our writing is unique and diverse, so when we see a fellow blogger, or friend become published and not us, let’s not be harsh and chastise ourselves. Our day will come, maybe not tomorrow, but one day. I hope that 2014 will be a great year for all of you. I wish you all lots of success, happiness and inspiration. Everyone will have their day if they're persistent in this industry. Great positive energy. I loved this part: "Our day will come, maybe not tomorrow, but one day." I totally agree. We will reap what we sow. Fo some its sooner, others it is later. Just have to stay with it and keep writing, networking, and promoting. Best wishes to you and yours for 204! Very nice. Great message to start off the new year! Great post. I really needed to hear that today. Thanks and have a great 2014. Great job, Murees! You've learned to be more positive and people are responding to that message. I hope it's a great year for you. That's right - keep doing the best we can and be persistent. It's all in the timing and everyone's time will come. Isis - Thank you. Your words are very true. Chrys - You are so welcome. I hope 2014 will be good to you. Stephen - Thank you so much! Your words are very true and inspiring. James - Thank you. I hoped to brighten at least one person's day. Sydney - You are welcome. Have an awesome 2014. Deanie - Thank you. I tried to inspire others with my post. Alex - Thank you. Your words are very kind. Love the positive sound of this post. Have a great writing year! Annalisa - Thank you. I hope that 2014 will be great for you as well. I am glad to see you staying so positive. It is so easy to find fault, but harder to enjoy where we are. Leanne - I hope that 2014 will be a wonderful year for you filled with lots of adventure and success.